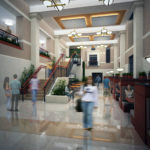 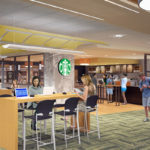 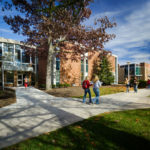 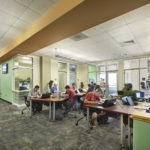 The collegiate concept of a library has slowly evolved to be the academic center of a school, the heart of the campus or the social hub of a community. 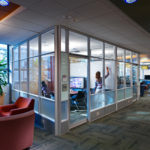 With this in mind, we have adapted these principles and applied them to our designs to create a space for students to interact and learn. 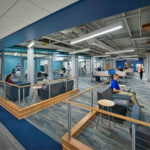 Building on our experience of creating vibrant social hubs in student unions and other quality-of-life markets, we understand how today’s students learn, how teachers educate, and how to design environments that facilitate active learning so everyone realizes their fullest potential. 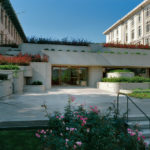 We also understand the evolution of information. 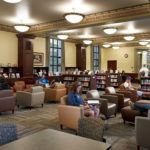 Libraries are now a one-stop-shop for a variety of services such as research, academic excellence, digital media creation and editing as well as interview preparation. 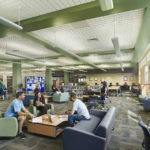 Common spaces create easy access to a full range of resources to meet the needs of each.